India is home to diversity. It is the land sprinkled with a potpourri of distinct customs, cultures and colours. And with an assortment of cultures comes a heterogeneity in traditions too, like the various marriage traditions of the different regions of our country. Weddings are an event everyone looks forward to; whether it is one’s own, or for the fun and festivities that come with attending another’s. The food, the decorations, the venue, and of course, dressing up! Every girl loves to dreams of the perfect wedding, and needless to say, herself looking nothing short of a dream. The perfect outfit, jewellery and hairdo. Brides-to-be of every region in the country have a fixed notion of how they want to look on the happiest day of their lives. In this day and age, the amalgamation of traditional and modern styles is the go-to look most brides strive for. Yet there’s something about those typically conventional attires that are still so breathtaking. Every community and region of our secular country has its own special style of dress. Paying ode to the fashion gods, old and new (yes we’ll talk about GoT fashion soon, Darlings), we bring to you some of the most distinct classic bridal looks from most regions of our beautiful nation. Punjabi brides usually wear Patiala Salwar Kameez embellished with lots of sequin and bead work, and a matching Odhna to cover their heads. The Patiala salwar, unlike the regular salwar, is loose and has multiple pleats that gives it a distinct fall and cut, worn with a knee-length (or shorter) fitted kurta or Kameez. 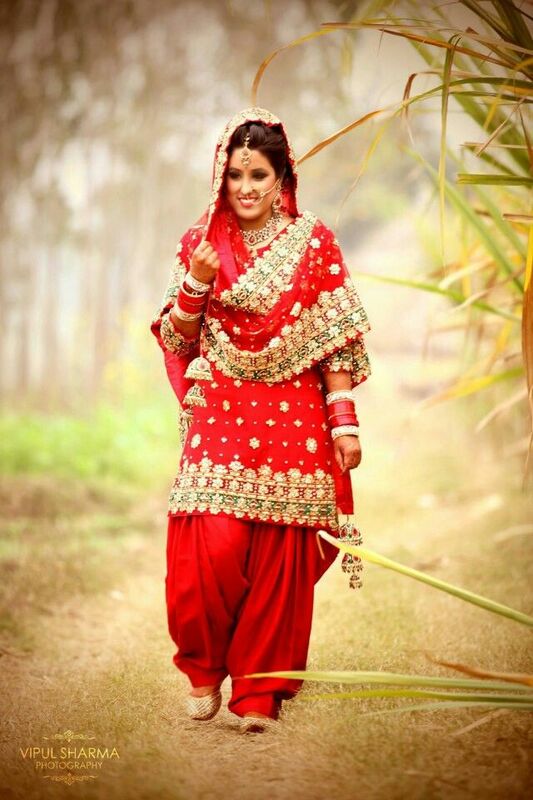 Apart from the their Maang Tika, earrings and necklaces, Punjabi dulhans also typically wear Chudas, which is a set of 21 ritualistic red and ivory bangles worn on each arm, and ceremonial charms or Kaliras (gold, silver or gold plated traditional trinkets) tied to one of the bangles. The Kalira charms are made fall on the head of unmarried girls, post the wedding, and whoever they fall on are said to be next in line to get married. The women often tie their hair in long braids with a fancy Paranda at the end. Bengali weddings are known for being abuzz with festivities, fun rituals and exciting food that turns everyone into gluttonous pigs. Just like the weddings, Bengali bridal fashion is one of a kind. It’s characterized by a red and gold saree, elegant gold ornaments, a large red Bindi, intricate Chandan designs drawn above the brow to accentuate those big beautiful eyes, and a white Mukut worn on the head. Bengalis are big fans of Alta (a red liquid substance used to draw designs on the skin), but Mehendi can be used to decorate the hands and feet too. South Indian weddings are plush with rites and rituals typical of their native beliefs, usually performed at a temple. 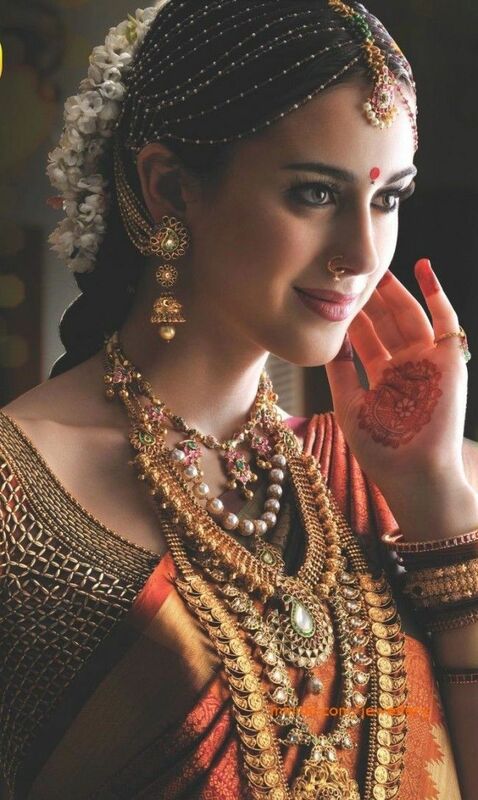 The bride wears a heavy silk Kajivaram saree, with loads of gold jewellery. The gold ornaments are taken to be very auspicious among South Indians. Amongst their jewellery one will find elaborate Maang Tikas that line the forehead and run down the parting of the hair, along with the Sun and the Moon hair ornaments on either sides of the parting. They also wear a Cummerbund at the waist (also made of gold) and usually a Bajubund (arm bracelet), and gold anklets or Payals. The hair is worn in a long plait, spruced up with flowers and decorative plait ornaments. Maharashtra exhibits a culture that is a fusion of the southern Dravidian and the northern Aryan culture. The bride is made to dress in such a way that she must resemble the Goddess Parvati. She wears a traditional Nauvari or a Paithani saree, silk with gold border, defined by a border of oblique square pattern and a Pallu having a peacock design. The hair is done up in a bun, adorned by Mogra flowers and a Nath or -nose-ring is worn. 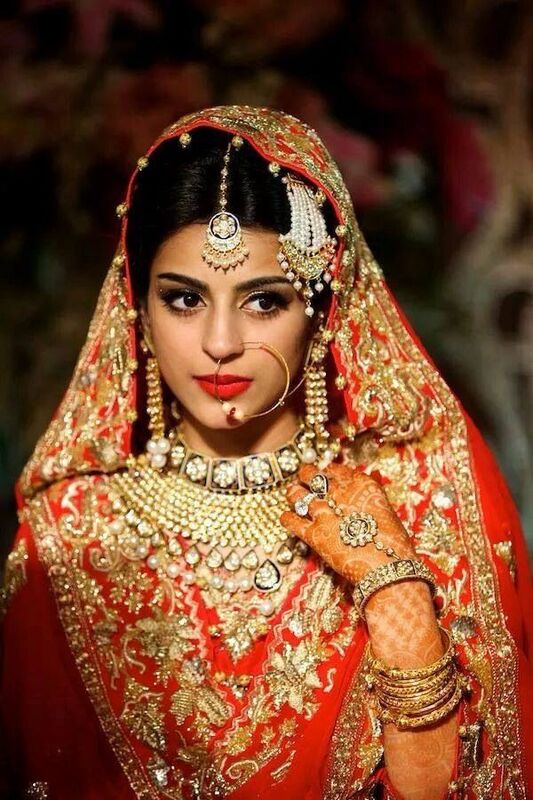 Jewellery and make up is kept simple, although that’s no easy feat, considering the bride must look simple, yet beautiful. But the most essential part of the dress is the Mundavalya, worn by both the bride and the groom, it is a string of pearls that lines the forehead and hangs on either side of the face. Oh, haven’t we all dreamed of being married in a gorgeous church wedding? Goan Catholic brides are the envy of most Indian girls with their long flowy white gowns (sometimes with a train) inspired by western designs made out of luxurious and rich fabrics like silk and chiffon with delicate embellishments, ornate jewellery and a veil. They carry a beautiful bouquet during the wedding ceremony. The overall look is classic, oftentimes with a slender hint of modern influences. Himachalis consist of Rajputs and Brahmins. The women of both the castes have a very similar bridal outfit. They traditionally wear long Kurtas and Salwars, Ghaghras and Cholis. They complete their look with simple make up and very distinct pieces of jewellery, namely the massive Maang Tika and enormous Nathni or nose ring, both typical trinkets of the Himachali hills. 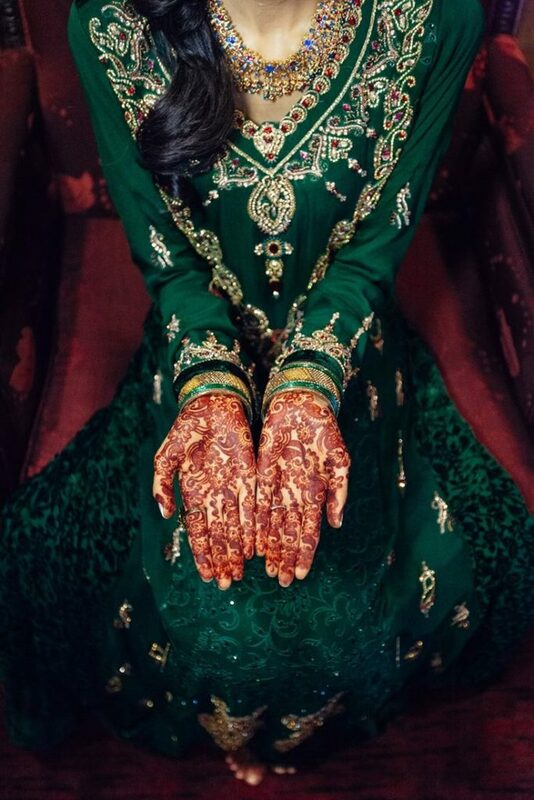 Indian Muslim brides have their own enviable, gorgeous look. Usually adorning a Lehenga or Salwar suit, they accompany it with bright make up and dark shades of lipstick, along with jewellery usually studded with stones. They typically wear a Maang Tika along their parting with another Jhoomar Passa on the side of their head, resting on the temple. Scientific researcher in-the-making, but writing is what captures my heart. Highly opinionated one moment, freakishly diplomatic the very next. Jack of all trades, master of, well, at least some (I'd like to believe). Headstrong and an eleutheromaniac, I'm on the perpetual journey to self discovery.